I am testing Writely, an Web based document editor, to post to my blog. Web based means that to use the word processor, you don't need to download any program into your computer, you just need to get online and sign into your Writely account. 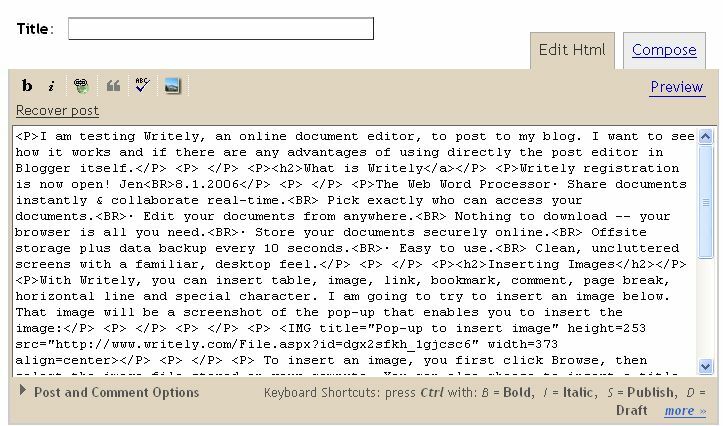 You can use writely to prepare and publish into your blog without having to sign into you r blog account. 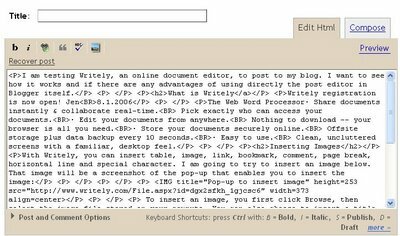 I want to see how it works and if there are any advantages of using W directly the post editor in Blogger itself. To insert an image, you first click Browse, then select the image file stored on your compute. You can also choose to insert a title to the image. In my test, I did that. I typed "Pop-up got inserting image" into the title field, but as you can see, the title is nowhere to be seen. You can set the the width and height to image size or pixel. However, it is not importent as after you have inserted the image, you can drag and drop to resize the image. You can set the alignment to top, bottom, left, right, center and middle. I have set the alignment to center, but it doesn't seem to make a difference. When you have finished setting your preferences, you click OK, and after some time, the image appear in the editor window. You can drag it to wherever you want. This ability to insert image is an important feature especially as it gives you one more option to insert image when inserting image direct in your blog program fails (Recently there was a lot of complaints of being unable to upload images in Blogger). Note that there is no title. This is bad for the blog, and especially bad from the point of view of search engine ranking. It would be advisable after publishing from Writely to log into Blogger and add a title. I also noted that the first screenshot (uploaded from Writely) is hosted by Writely. This is an advantage if you are worried about your limit for your Blogger account. FURTHER UPDATE: After editing and publishing through Blogger, all the fonts have gone back to normal. Don't know what is going on. Also, there is a disadvantage with using Writely to post, and then editing your post with Blogger. If you want to add something from Writely, for expample, another photo, you may face problem because the document in Writely and the document in Blogger will be different, and if you don't change the document in Writely to reflect what you have edited in Blogger, and then add the photo and republish, you will lose what you have edited in Blogger. UPDATE 3rd October, 2006. According to Writely's Help files, at the moment, you can't publish to Blogger Beta via Writely. I adore the idea of writely, but have had a constant problem with it -- a bunch of my text mysteriously disappearing for no identifiable reason while I'm typing. I'm able to get it back by opening a previous revision, but what a hassle. I can't figure out if it's a problem on my end (bumping a wrong key? but why doesn't this cause a problem when I use MS Word?) or on their end. Until I figure this out, I can't recommend it to anybody. Yesterday and today I am having a problem with Blogger: the pictures don't open on all blogs host from Blogger. I see a little box with an X in it where a picture should be. But I am not having trouble on my own blog. I can see the pictures on my own blog and on your blog, too. I don't have this problem on others sites, like Typepad and so on. Could you please help me with this trouble? I also leave a message on your e-mail. Thank you so much! Many people are reporting the same problem. Maybe we have to be patient and wait for the problem to settle down. Thank you so much Peter! I just received your e-mail, too! Thanks again! Blog hijack, how to protect yourself.